Oh! I get it, clever. Very Clever. She’s the Queen of Hearts because she takes hearts. Anyway back to three narratives. The first deals with how Cora met Hook. Regina wanted Hook to take Cora’s heart but Cora doesn’t wear her heart in her chest, like a peasant. Cora offers Hook a better deal, he gets her close to Regina so Cora can take her heart, geeze this family. However Regina says she killed her out of love being a weakness and Cora, who is playing dead, has a change of heart, pun so intended. Cora then protects a corner of the kingdom from the curse, hence why a part of Kingdom was fine and when Emma breaks the curse, Cora and Hook will go to Storybrooke for revenge and yet to be determined. Next up in Storybrooke, Regina is trying to change, to be a better person but Rumpelstiltskin cautions her that they CAN’T let Cora get through the portal. So Rumpelstiltskin and Regina use all the fairy dust to set-up a death trap. People find out and Henry does this WHOLE thing about how good wins and have faith in his faith in Emma, yadda yadda yadda. So Regina stops the storm but who comes through? In the Enchanted Forest, oh boy. Cora traps the crew in the enchanted prison cell and she gets the compass. And to make things worse, Rumplestiltskin used up all the magic ink, writing Emma’s name over and over again. However Snow manages to use the ink to bust out. So yeah Rumpelstiltskin could have left at anytime. So everyone meets at the magical cure-all lake, which Cora fixed and used it to restore the wardrobe’s magic. Question why can she restore the lake but not the wardrobe? Anyway, there is a fight scene during which Mulan gets Aurora’s heart back and Cora tries to take Snow’s heart. Emma however jumps in the way BUT Cora can’t take Emma’s heart. In the end Emma and Snow go through the portal. However don’t feel too sorry for our villain pals. Hook got the petrified magic bean from the giant and they use the cure-all lake to restore it. Also Mulan restores Aurora’s heart and they go off to save Philip’s soul as Cora said something about souls consumed by a wraith are in some other dimension. I think there is a pin on that plot till later. I thought Snow and Emma’s adventure in the enchanted forest were going to last MUCH longer but sure move it along. It was a sappy episode especially with Henry’s speech about faith and love is strength part. But yeah it was a fine episode. Not boring. Though these people must use quick travel because they get to places FAST. Wikipedia says this was the winter finale so that is why this plot got solved. How neat and tidy, so an okay episode. Heh, a pun. This episode was meh. It does open the story up as Cora and Hook are up to shenanigans. Basically this episode core theme is a redemption of the Regina kind. And since she didn’t murder Han Solo she seems to be ok I swear Star Wars fans are weird about that one. I digress. In Storybrooke Regina is persona non grata but since Henry believes Regina is changing Emma tries to believe in Regina. Regina asks Emma if she can still be in Henry’s life, apparently the whole adoption is null and void since curse broke? What? 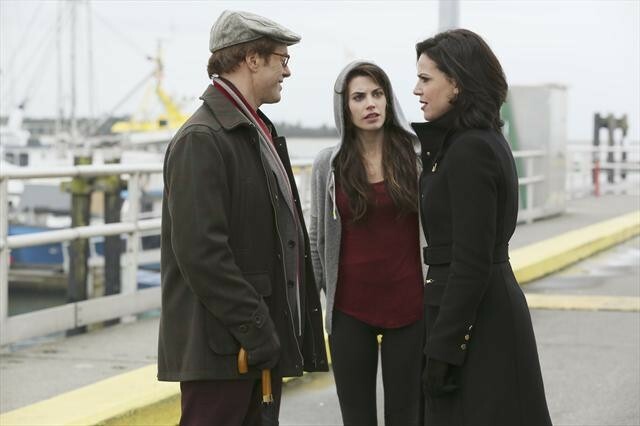 Cora then frames Regina for the murder of Dr.Hopper whom Regina got into an argument with on the pier which Ruby saw. Emma’s super lie detection kick in when questioning Regina, however Snow and Charming think she totally did it since all the convenient evidence points to Regina. However since the dog saw the whole thing, Emma and Rumpelstiltskin use magic to see Pongo’s memory and confirm it was Regina that did the deed. Actually it was Cora as Regina and some corpse deguise as Archie, Archies is fine. Kidnapped by Cora and tied on Hook’s ship but fine otherwise. Then the character’s past. Snow and crew capture Regina and believe she can’t change. Snow tries to convince them that they still good in her, that she felt it and she won’t turn Snow over the emperor, wait wrong thing. Rumpelstiltskin sets up a deal with Snow with no price that is a test for Regina. Snow lets Regina go but she tries to murder Snow. 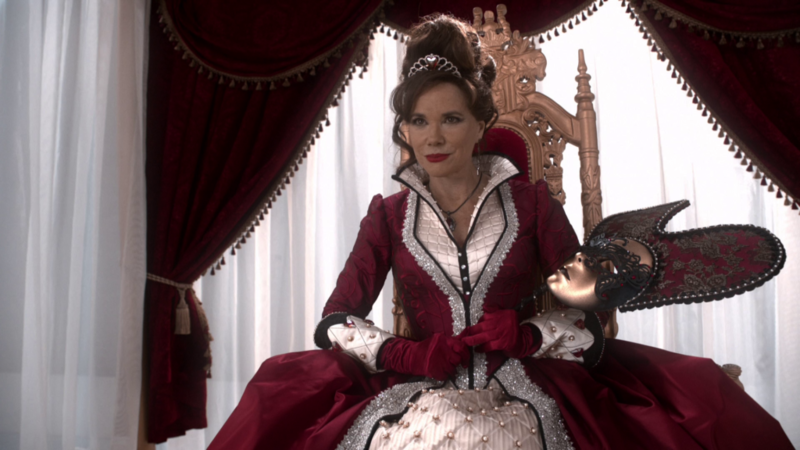 Rumpelstiltskin enchanted Snow against her so Regina can’t do anymore physical harm to her in their world. Regina is then banished and the curse threads are planted, if Regina can’t hurt Snow in their world then she can hurt her in another. Yeah this episode is just ok. Not bad but definitely back to a slower pace. I guess that is because in a sense this a soft season opener. But that Emma lie detection. Emma knows both Ruby, who saw not-Regina enter Archie’s office and Regina telling the truth and since she is cool with magic she can’t fathom another option besides Rumpelstiltskin?